Do you want your kid to feel like a fairy-tale hero in a forest glade? 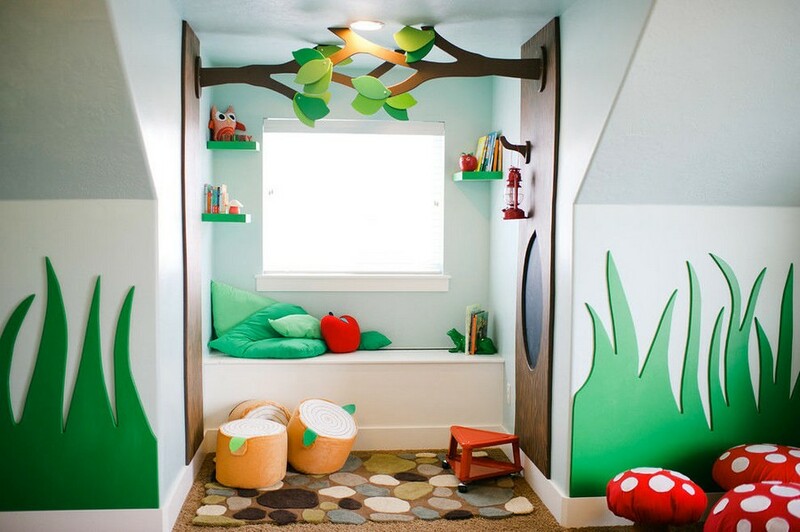 Create an exclusive playroom for him or her! It’s possible even in irregular-shaped areas with low and sloped ceilings. 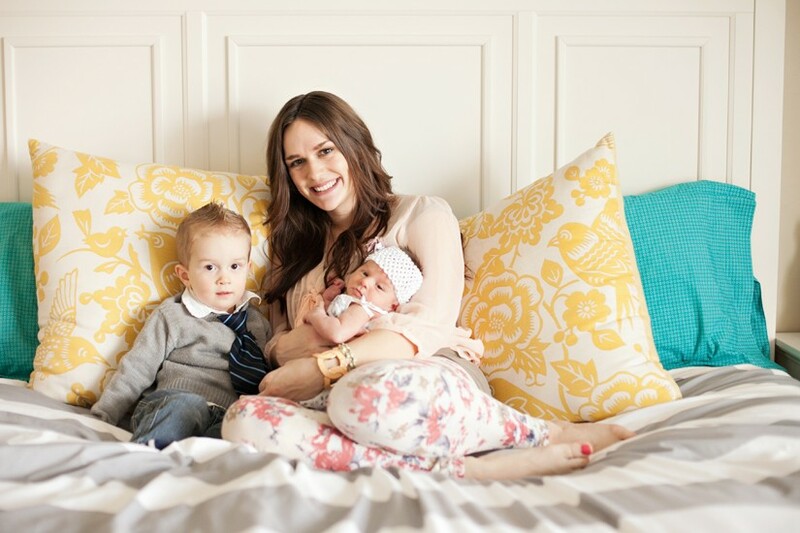 Thus, Mollie Openshaw, a designer from Washington, managed to make her childhood dreams come true in the playroom she designed for her kids. When she was a little girl, she saw herself as a fairy and dreamed of having a small forest glade right in her bedroom. Now Mollie is a grown-up, but her childhood dreams are still with her, and she decided to present a fairy-tale to her kids. Let’s have a sneak peek at what she did! 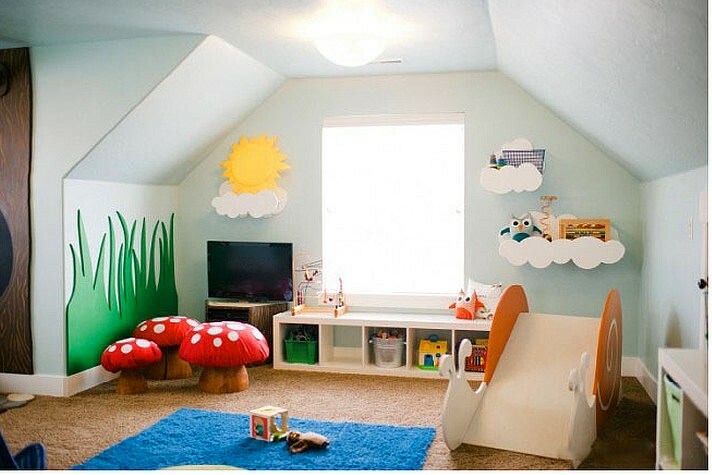 This playroom is located on the attic floor. As a rule, such space can’t boast having big areas, and Mollie did her best to make the most of each of 7 square meters. To expand and counterbalance visual boundaries of the non-standard space, she opted for light colors in both ceiling and wall décor. They’re pleasing to the eye and create a perfect background for a fairy-tale glade. Kids love small spaces, where they can dream, play and watch the world around from a window. Forest theme can be found in almost every interior detail. The space is penetrated with magical atmosphere, and this is to a great extent due to the presence of 3D elements. Mollie prepared the sketches of grass, clouds, leaves and snail-slide, and her husband, a craftsman by profession, carved all these images in wood and fixed all the details with glue and nails. 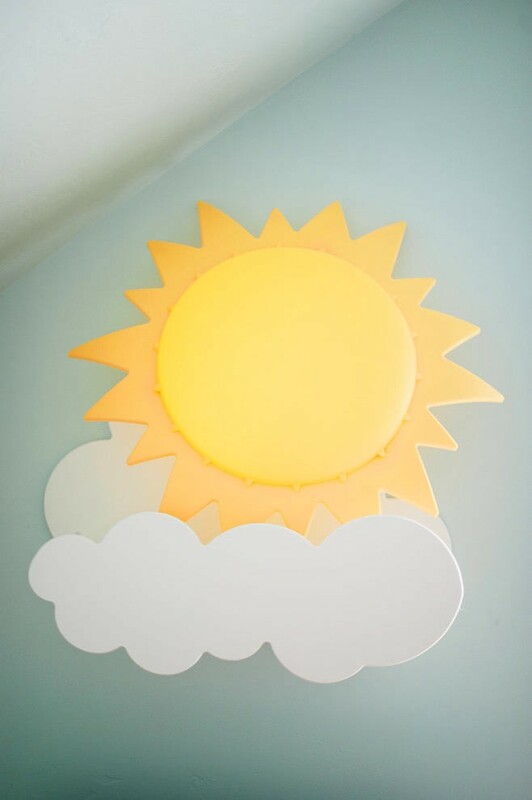 All the pieces are made from MDF; this material is more light-weight than veneer, easier to process and more appropriate for creating fanciful shapes. A detail that deserves a special mention is cloud-shaped bookshelves that seem to be floating in the air. The toys displayed on them look like travelers on the clouds. Despite the fact that Mollie was passionate about implementing her childhood dreams, she didn’t forget about fundamental “serious” aspects, like shelves and storage baskets easily reachable by kids. A low cabinet by the window is in fact multifunctional – it’s not just a storage spot, but also a nice window bench and observation post. Mollie planned it as a cozy reading nook and added a few soft comfy throw pillows and a lantern. 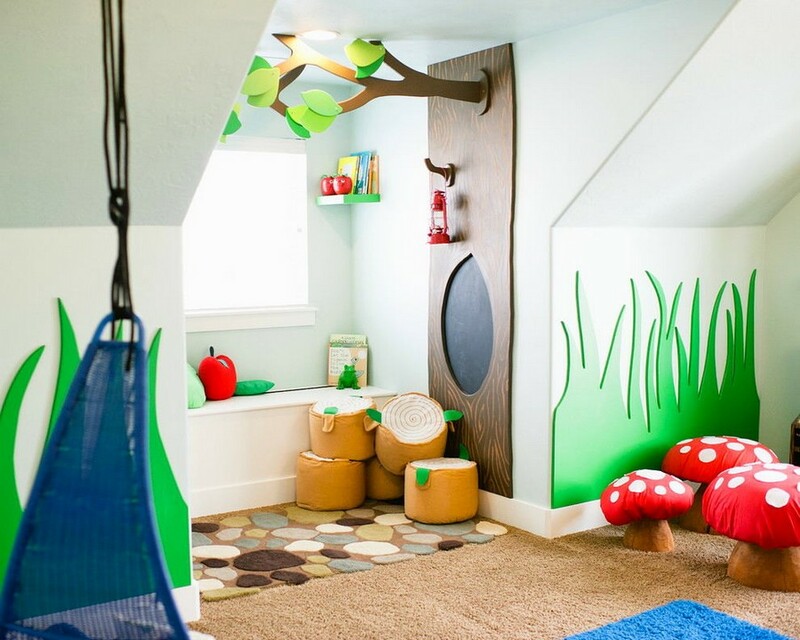 The playroom looks like a genuine forest glade. 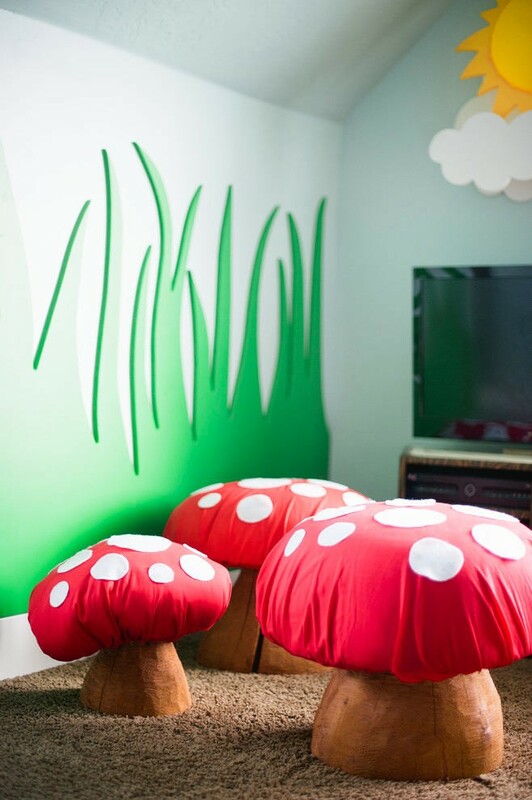 And to make the magical atmosphere even more realistic, conventional kids’ chairs were replace with compact ottomans shaped like bright fly-agarics and stumps. The stumps were complemented with small leaves that play the role of handles for the sake of improved mobility. A small, yet important detail adding to the sense of coziness is a decorated sun-shaped wall lamp by IKEA. It’s like a warming finishing touch in the interior of the room.